Calatheas are a group of plants native to the tropical Americas. They are popular as pot plants for the house or conservatory due to their decorative leaves that often react to touch or light. Calatheas are now being cross bred amongst their 50 or so species and Wavestar is one of the results. The leaves are soft,ridged, purple underneath and green when open in full light. The leaves close up in the evening. I was surprised to see the yellow flowers at the soil level last time I watered this plant see above. This variety is said to originate from Bahia in Brazil but if so why has it been granted PBR status? ‘Decorum Plants’ are a brand name that claims to be a leading specialist in the trade sector for more than 10 years. Decorum Plants represents a selection of 1200 decorative and flowering potted plants under the well-known (to some)‘Decorum flag’. Keep soil moist and humid throughout spring and summer with less watering in winter. Keep your Calathea warm preferably 15-23ºC. Feed with a dilute fertiliser weekly during summer. Soil should be light and free draining. Calathea makoyana the Peacock plant, features purplish coloring on the undersides of leaves, with white and green on top. Known as the peacock plant. Calathea zebrina the zebra plant, has green markings on the leaf top and purple leaf undersides. Calathea insignis also called Rattlesnake plant, is a bushy species with narrow, tapering erect foliage. 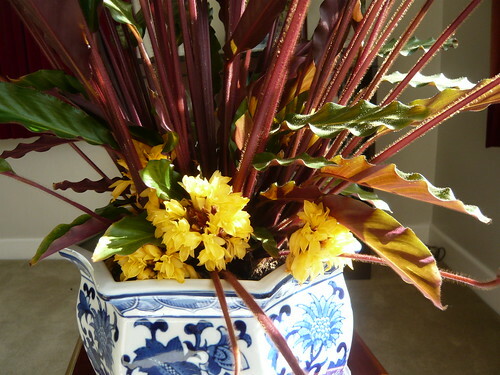 Calathea crocata has plain leaves but displays of upright orange-red flowers. Calathea ornata. Reddish marking on leaf tops with purple undersides. 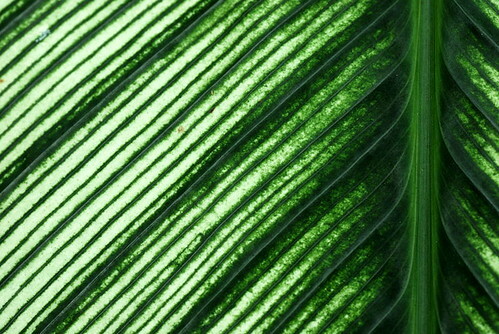 Calathea louisae has leaves broadly ovate, dark green with light green splotches along the midrib. Calatheas are closely related to Maranta, and often confused with their species Ctenanthe and Stromanthe. Calathea can thrive in bottle gardens and terrariums due to their liking of high humidity. Calatheas are propagated by divisions or tip cuttings, with nodes to form the roots. Mist and reduced light are important during the early stages of propagation.